At completion, Canyon River Ranch will be comprised of the ten suite lodge adjacent to Red's Fly Shop and Canyon River Grill, and a total of just 20 cabin sites. Four new cabins will be under construction this Spring! 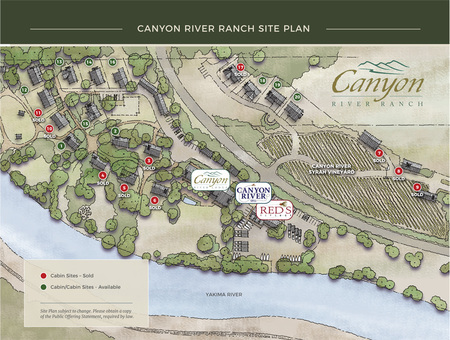 This is the final phase of Canyon River Ranch, making this opportunity rare and attractive. At completion, Canyon River Ranch will have a total of only 80 owners - sixty in the lodge plus the twenty cabin site owners. The small number of ownership opportunities is essential to the value of Canyon River Ranch, and to the Canyon River Ranch experience. Cabin sites come complete with water (system installed and completed mitigation certificate assigned), electricity, and septic service stubbed to the site. Design guidelines to ensure appropriate and compatible architecture are set forth in the Cabin Design Book prepared by Mithun, one of the most experienced and highly regarded architectural firms in the west. The Cabin Design Book is available upon request. Cabin site #12 is one of just two remaining riverfront sites, setback 200' from the river. Sites 13, 14, 15, and 16 are set back from the riverfront sites and provide dramatic views of the Yakima River canyon. Sites 18, 19,and 20 are located above the vineyard and offer a desirable southwest exposure and expansive views of the Yakima River and canyon. Access to these sites is through a private gate and lane within the Syrah vineyard. Site #10: SOLD! Spring 2019 Construction! Site #11: SOLD! Under Construction! Site #17: SOLD! Spring 2019 Construction! Site #7: Vineyard view lot - SOLD! Spring 2019 Construction! Site #9: Vineyard view lot - SOLD! Canyon River Ranch cabin #5: This 3205 sq foot cabin was built in 2010. 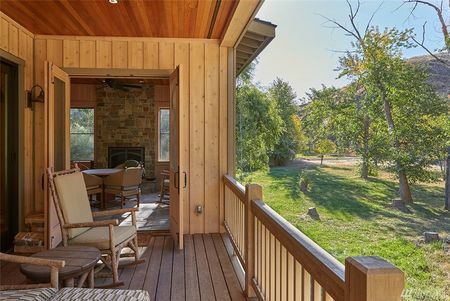 With 4 BR and 2.75 BA, it offers a perfect combination of indoor and outdoor living space that takes full advantage of the amazing views of the river and canyon walls beyond. The floor plan was designed for group gatherings and easily accommodates multiple families sharing the space. The quality of finish in this cabin was completed to the highest level possible. 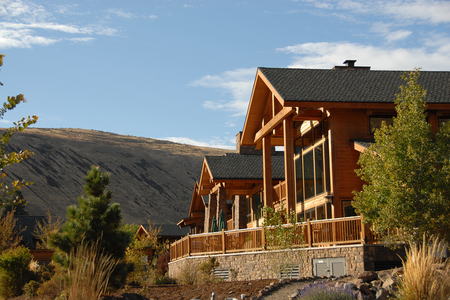 The full amenities of Canyon River Ranch including swimming pool and hot tub, game room, lodge great room, vineyard, boat launches, and Red's Fly Shop and Canyon River grill are located next door. (This cabin is located right in the middle of the busiest section in the Yakima River canyon.) The float-in ability to utilize this property is second to none. One of our favorite things to do in the summer months is to fish late evenings and early mornings. For this property, that simply means floating in and tying off the anchor for the night and walking in the back deck door. Next morning, your boat is in the water and ready to fish the early morning bite. In addition to the excellent fishing opportunities that are just out the back door, Canyon River Ranch is also surrounded by public land and provides wonderful hiking and access opportunities. It is common to see turkeys, mule deer, and big horn sheep right out the back door. SOLD!! !